The California Lottery is set up like most other lotteries in the United States – with the aim of funding or supplementing public school education at primary, secondary and higher institutions. 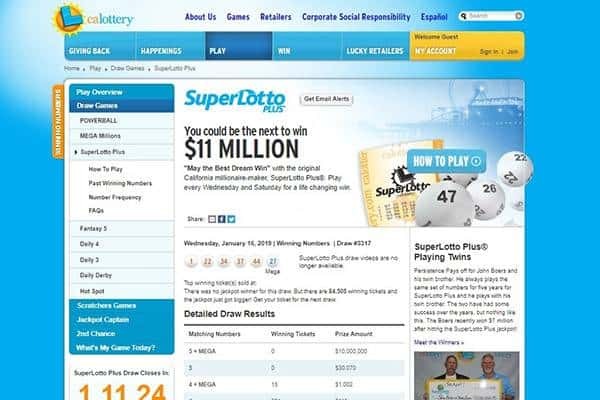 Established since 1985, it is among the longest-standing lotteries in the US. Players can use cash or card to make purchases and the winnings are regularly posted. Taxes are applicable to this lottery and a few scams have threatened to destroy its credibility but they were however not directly linked to the lottery. The California State Lottery offers both the national jackpots alongside their special games. 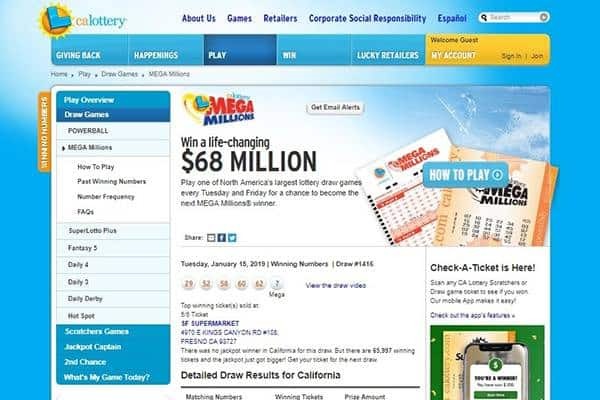 They run the major games including Powerballand Mega Millions and invites players who are not resident in the United States to play and benefit from its entertainment options. 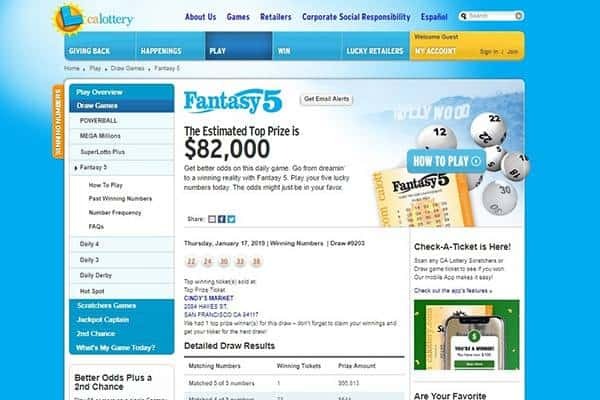 The CA lottery also has its own special games including the Fantasy 5, Daily 3, Daily 4, Daily Derby and Hot Spot. Some of these are small lotteries but have really good odds and almost always guarantee players a win with its variety of ways to win. Only 13% of the California State Lottery earnings can be spent on sales and administration costs with the other 87% being dedicated to public education through prizes or directly with money. The winning numbers of the lottery are posted regularly to ensure that players keep in touch with updates and can claim their winnings. One unique trait of the California lottery is that games are player vs player, with the State being unable to benefit or having any interests in the outcome. 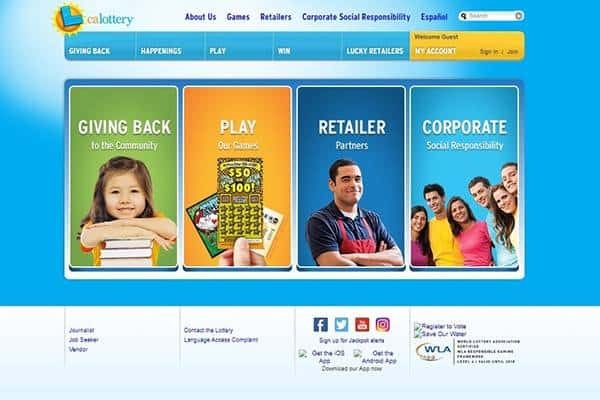 The CA Lottery has a mobile app which is available for Android and iOS on the Apple App Store and Google Play Store. With the app, players can scan tickets, track their submissions, get winning numbers, check on the jackpot winnings and amounts and find out news about the lottery and promotions which are currently available. They can also get customer service information, office and retailer information. The California Lottery operates the second chance lottery and occasional promotional prizes with the rules of each promotion varying and will be announced per promotion. Deposits and purchases can be made at the closest retailers using cash or credit cards. Some games are also available at game points, pumps, ticket and vending machines. Prizes might take up to 6 weeks to be received upon confirmation. A claim form is required, to be dropped off at the California Lottery’s district offices. Claims can also be sent by mail with the responsibility for any losses being placed on the players rather than the lottery. For prizes above $600, a claim form must be filled, printed and submitted at the nearest Lottery District Office or can be mailed. Claim forms are available for players in different languages which include English, Spanish, Chinese, Korean, and Vietnamese. Most claims are to be made within 180 days of the prize and payments can only be made to players who are over 18. 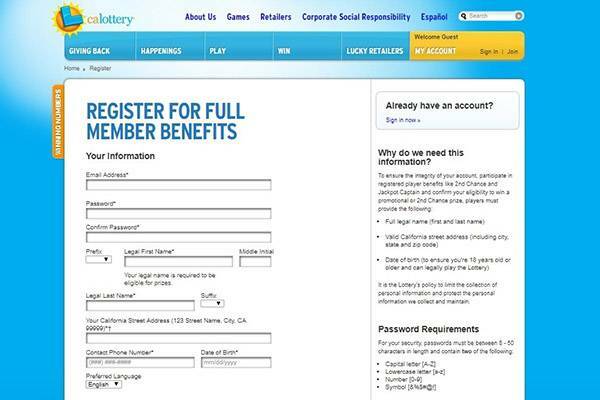 California’s online lottery has an extensive FAQ page covering many different subject. Visitors to the site would most likely find an answer to many of the questions they might come up with. There’s no Live online chat available, something that many does and became expected. IS MASSACHUSETTS (MA) LOTTERY LEGIT? The California State Lottery has an official site that is authenticated by Google Safebrowsing, Website antivirus and Norton Safeweb. It is also certified by the World Lottery Association at a Level 4 which is valid until 2018. A few people have tried to create scams around this lottery by approaching people physically at malls, stores and even hospitals asking that for their help to claim their winnings because they are unable to do so and non-US citizens, usually requesting money to make the alleged claims. There have also been a few complaints around retailers not honouring wins but these are not directly associated with the California Lottery. We rate this a 3 of 5 and would highly recommend it. The California State Lottery is an official government operated lottery that seeks to provide for public education in California as well as offer its players fun and entertainment.